Animateducated: You are the Client! Does this ever happen to you? You are working on your own project with a deadline you hope to reach when suddenly, an outside job opportunity comes along. Now you have to drop everything again and work on this other project, which is paying for your time and expertise. First, when starting a job you need to find out all the information you can about what they want, when is their deadline and how much will they pay. Once you have some of this info, you need to put together a bid or an estimate of how much time and labor it will take you to accomplish the project. I'm skipping over all this stuff since this is not a business blog and going right for the animation process stuffing. I will mention that when I bid on this job, it was a totally different idea when my bid was approved. Luckily, even though its was a different idea altogether, the new idea was a lot simplier than the first, but does involve some character designs and rough storyboarding. 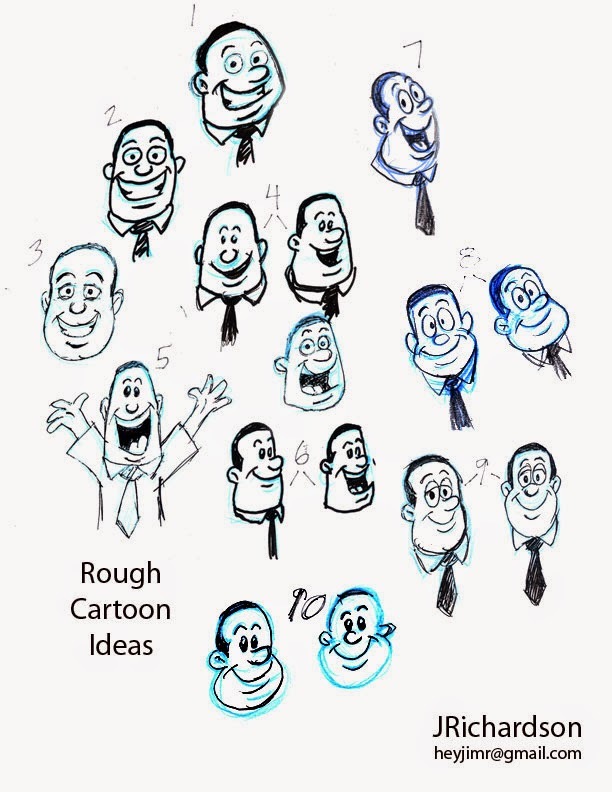 Most large studios or ad agencies have a storyboarded concept and character designs already to send off to the chosen animation studio. Smaller places don't. The client sent me a photo of a real Car Deal guy, who I'm suppose to create a cartoon version of and so, experience has taught me to draw a bunch of rough ideas, number them and let the client decide which one they would like me to do more work on. And now, You are the client! Here are 10 possible cartoon characters, perhaps the next Homer Simpson! Which Cartoon guy do you like and if you can tell why? The real Client already made their choice, but I want to hear from you!!! You may send me a comment and let me know which number you like and I won't mention your name.